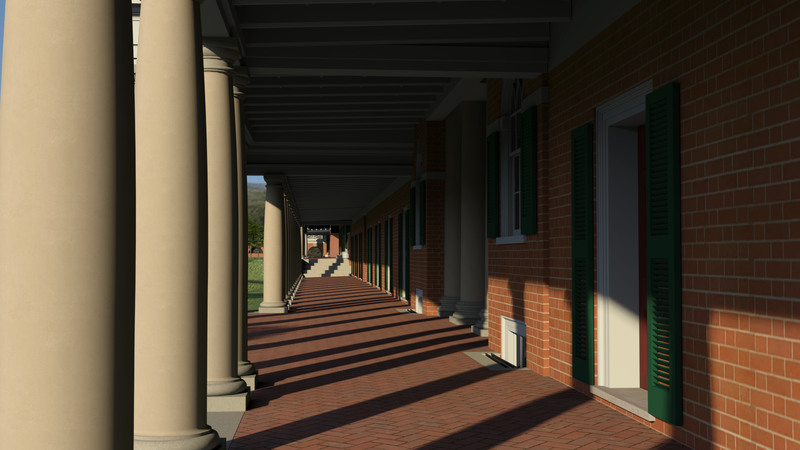 By late June 1819, Thomas Jefferson had created the drawings for the five East Lawn pavilions, one of which is Pavilion VIII; the construction of the pavilion was part of the 1820 building campaign. The design of the Corinthian column capitals came from Chambray’s Parallele de l’Architecture antique et modern, while, according to Jefferson’s specification book, the design for the building came from Benjamin Henry Latrobe, an architect that he worked closely with during his presidency. John M. Perry won the contract for Pavilion VIII’s brickwork by September 30th, 1820, while James Dinsmore did carpentry work. Pavilion VIII was substantially completed by the autumn of 1822, and the Corinthian capitals, carved in Italy, were in place the following year. The first resident of Pavilion VIII was Charles Bonnycastle, Professor of Natural Philosophy, who resided there with his family from 1825 to 1841; during his residency, a doorway was cut to the student dormitory to the south for use as a study, and a basement story addition was made for the accommodation of enslaved individuals. He also had an arbor built in the garden. The first major addition to Pavilion VIII, a two story addition to the rear, was made in 1855, during the residence of Socrates Maupin and his family. Interior views of Pavilion VIII can be seen in a series of photographs taken during Charles Venable’s occupation in 1895. A brick one-story porch was built on the east façade in 1936, replacing an earlier wood one. In 1949, Pavilion VIII was converted into the President’s office and other administrative uses, and remained that way until 1984. In 1985 a massive renovation and restoration was undertaken, converting Pavilion VIII back into combined faculty living (in the form of two apartments) and student-learning space.